Anthropologie presents, a pristine sweater/cardigan that will definitely appeal to the Disney Princess in all of us. Sleeping on Snow took the poetic personalities of Sleeping Beauty and Snow White, combined them and came up with the Shape Shifter Cardigan. 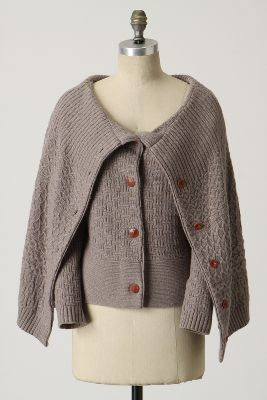 This cardigan is wool and nylon, imported and should be cleaned by soft hands - ONLY. Sizes available are S - L and the Price is $168. This cardigan can be transitioned from a short-cape style, to a long and flowy style in a matter of seconds. How is that for a 2 in 1?